Assuming a 5% increase in total division revenue, the OLED TV revenue at LG Electronics would show a 40% increase. Of course, as that 5% divisional increment changes, the incremental improvement in OLED TV sales revenue will also change, ranging from 34.7% for a 1% division revenue improvement to 46.7% for a 10% division revenue improvement, so the statement that OLED TV revenue will be 20% of total combined TV sales remains a moving target given that the company did not guide Home Entertainment divisional sales for 2018, but at least it gives some indication of LGE’s ‘intent’ to continue to grow its OLED TV business each year. LGE revealed pricing details for several of its 2018 OLED TVs, including the C8, E8 and W8. The company has yet to announce pricing for the most affordable B8 OLED series but considering that it will lack the Alpha9 processor of the other models C8 is probably the more interesting entry point. The 55, 65, and 77-inch C8 OLED TVs will carry suggested retail prices of $3000, $4000, and $10000 in the US. The 77-inch although extremely expensive is nevertheless getting cheaper. Last year, a 77-inch LG OLED TV started at $17000. The 55 and 65-inch E8 OLED TVs will cost $3500, and $4500, which are down $1000 and $1500 compared to last year’s E range models. The 77-inch W8 “wallpaper” OLED will cost $15000. LG will also release a 65-inch W8 but has yet to comment on the price. We will update the table below as soon as we receive more information. LG’s 2018 OLED models will start shipping in March/April. LG Electronics is hoping to lead the era of artificial intelligence-powered TVs with its new lineup of household sets powered by its AI platform ThinQ, the company’s home entertainment chief said Monday. At a launching event showcasing LG’s premium TV lineup for this year at LG’s R&D center in southern Seoul, Brian Kwon, president of LG’s Home Entertainment Co., told reporters, “In addition to our TVs’ perfect black and perfect visual quality, this will be a year for us to take the next step with artificial intelligence.” This year’s TV products from LG feature the company’s exclusive ThinQ artificial intelligence technology, which allows users to not only search for programs and control the TV through voice activation but also connect to other devices such as smartphones and game consoles through voice commands. Kwon, LGE’s TV Division Head, said that by 2021, global demand for OLED TVs could hit up to 10 million sets, roughly 10 percent of the worldwide TV market. Since the WW market is ~200m, we question this calculation. LG will focus on 13 countries including Korea, the US, Australia and 10 Europe countries, which currently make up nearly 90 percent of revenue for LG’s OLED TVs. At present, TVs’ artificial intelligence capabilities may seem to overlap with the functions of AI speakers that allow users to control multiple devices through voice commands. However, Kwon said that there is a fundamental difference between the way consumers embrace artificial intelligence through speakers and TVs. “Speakers are fundamentally personal devices, like smartphones, while TVs are shared devices among family members,” Kwon said, playing down the possibility that the two markets would eat into each other’s demand. He said that he saw AI speakers as a “bridge product” for consumers who are not ready to switch over completely to new home appliances and electronics with built-in artificial intelligence systems. “In the long run, I believe that artificial intelligence-powered TVs will be able to take over (the role of AI speakers today),” he added. 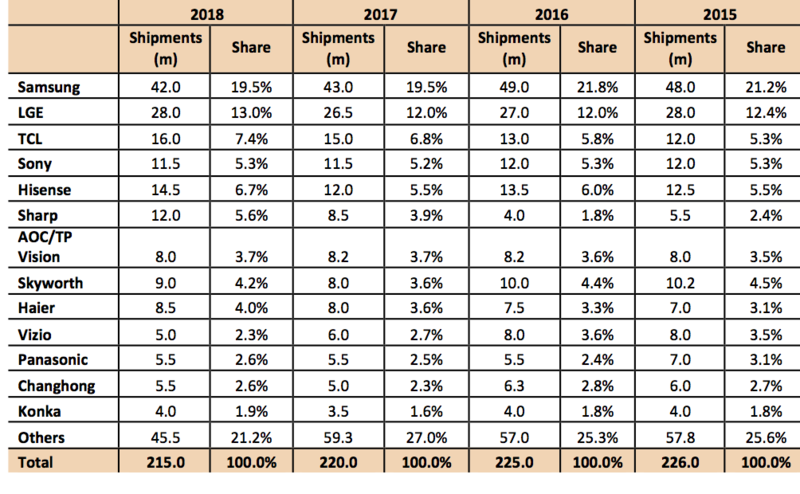 The current market share and history for TVs by brand is shown in the next table.